Discover one of Europe's best kept secrets – Montenegro, a country of magnificent nature and extraordinary history. Although Montenegro is a relatively new a sovereign state, it can pride itself on being one of the strongest and most independent spirits in Europe. Admired by Lord Byron and Bernard Shaw, Montenegro has something to offer everybody - beautiful beaches for those who come to relax and breathtaking bays and mountains for those looking for an adventure. Beautiful and relatively unspoiled, Montenegro is lush with a backdrop of mountainous forests that look black (Montenegro means black mountain) and also has 45 miles of gorgeous Adriatic coastline that includes 117 beaches! It is the perfect place to relax and kick back as it has the region's finest hotels, from the Aman Sveti Stefan to the Regent Montenegro in Tivat and more luxury openings on the way. The history of Kotor, a medieval fortress town is fascinating. The very best time to visit Montenegro is April, May and June and then in September and October. July and August can be very hot, however if all you want to do is relax in one of the glamorous resorts, this is also a good time to come. Montenegro is like a postage stamp on the Adriatic coast, dramatically designed with tall mountains, stunning beaches, deep canyons, interspersed with Greek and Roman ruins. Walled cities remain intact from several centuries ago. Kotor’s medieval splendor is offset by the beaches at Budva. A crucible of culture and history in the Balkans, the wealth of history that it contains within its borders is incredible. Roman mosaic, Serbian orthodox monasteries, Greek orthodox churches, and Ottoman minarets enhance its natural beauty. After touring in Kotor, have a leisurely lunch in beautiful Perast, on the bay of Kotor and famous for the islet of our Lady of the Rocks. Dense forest and soaring mountain peaks that rise dramatically from its shores hold great appeal for bikers, hikers and kayakers and sporting activity of any kind. Or just relax within its pristine environs overlooking the Adriatic. 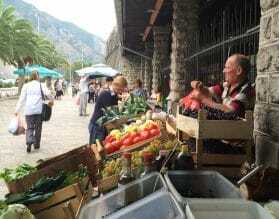 Montenegro is also a great place to experience rural life in the Balkans. Here one can still find family owned olive groves, ancient mills where flour is made into home-made bread, and backyard vineyards growing local grape varietals, that pair beautifully with the local cuisine. Indulge yourself in Montenegro’s charm and charisma with Exeter International. Montenegro fits well as a relaxing end to a Croatia sightseeing program. 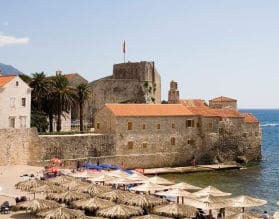 Do all of your intensive touring then end at the most luxurious resort in the region, Sveti Stefan. Enjoy a private boat tour, visit an artisan olive oil farm that has been in the same family for generations, or explore historic Kotor and Perast. On a cruise? 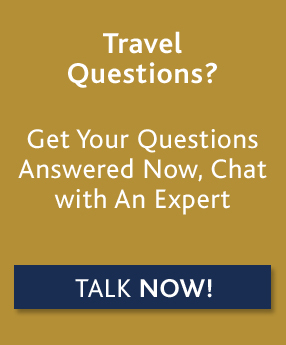 We can help with private shore excursions. Combine with our Croatia Self-Drive programs and are ideal for those that prefer more independence. We can also customize a unique program based on our Croatia Ultimate programs for the Dalmatian Coast and Istria, take a day trip to Mostar, or extend you stay further and include Sarajevo, capital of Bosnia, or Belgrade, Capital of Serbia.